Your models will probably benefit from a quick rub with fine sandpaper (400 grit or finer) along the edges to remove any stray bits of filament. Some printers will leave very faint horizontal lines on models, from the layering of the plastic as the model is built up. 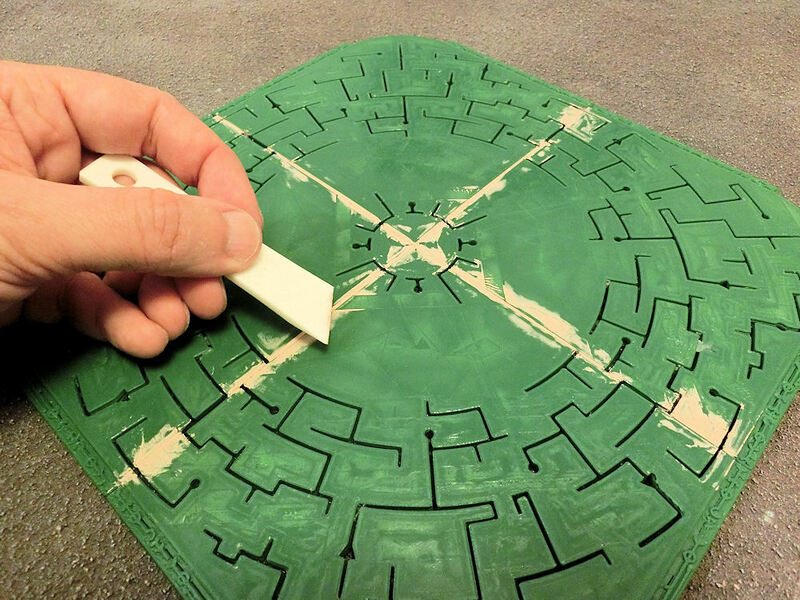 ▲ For large, flat areas (like much of our Necrontyr range) you can lay a large piece of fine sandpaper on a flat surface and gently rub the model along it for a few moments. 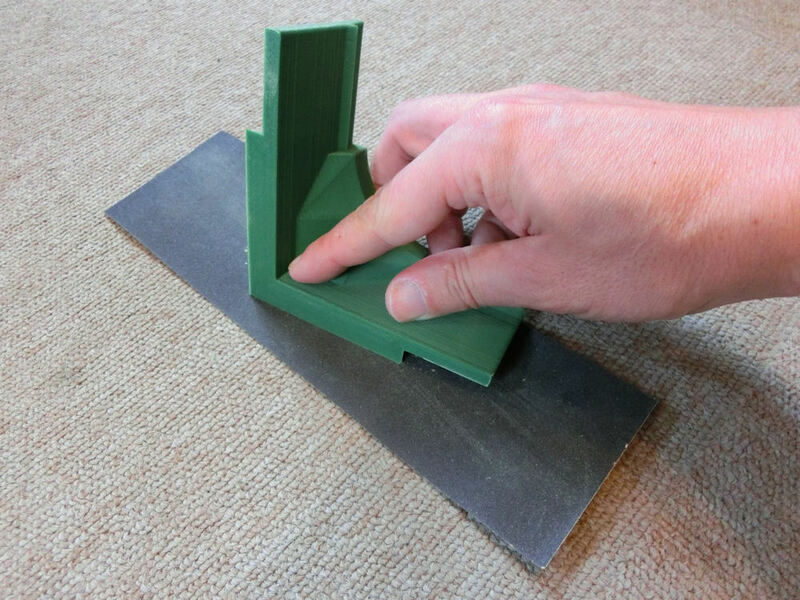 ▲ For smaller areas, we recommend using a flat sanding block. 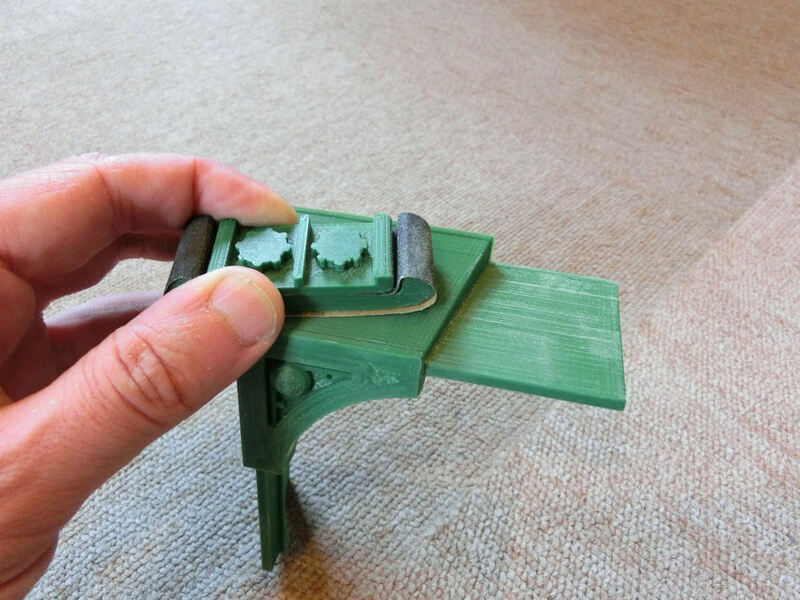 The sanding block in the picture above was 3D printed as a free model from the Thingiverse website, with a small strip of sandpaper wrapped around it. It helps you get into the nooks and crannies of the model. 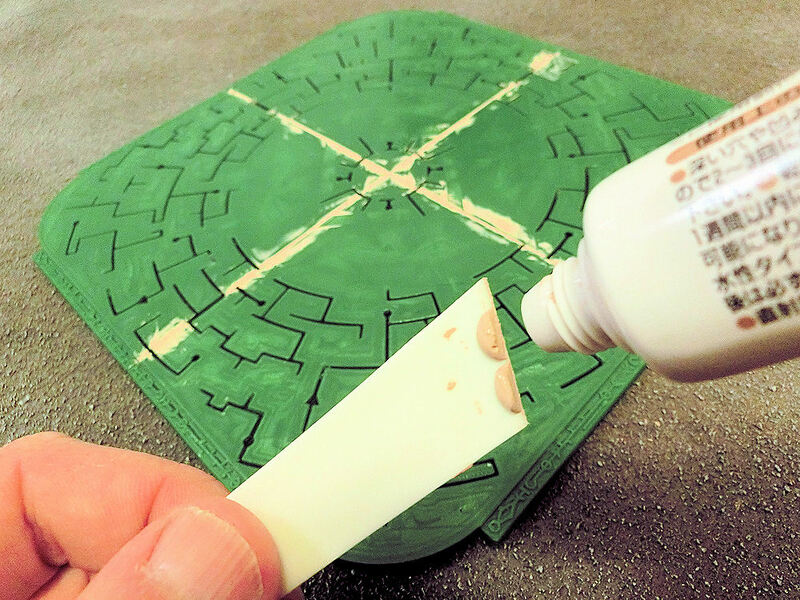 If you use sandpaper on a model, don't forget to wipe surfaces with a damp cloth before undercoating! 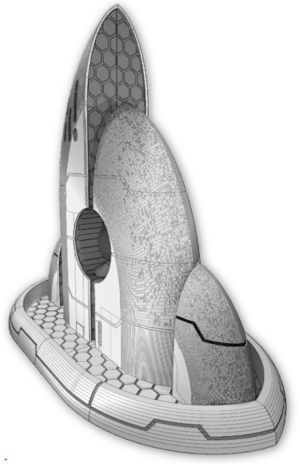 Some of our models are designed to be have multiple parts joined together. Some modelers might prefer to smooth over the joints between panels, and this can be accomplished quite easily using filler. Filler can also be used for filling small gaps left by your printer. 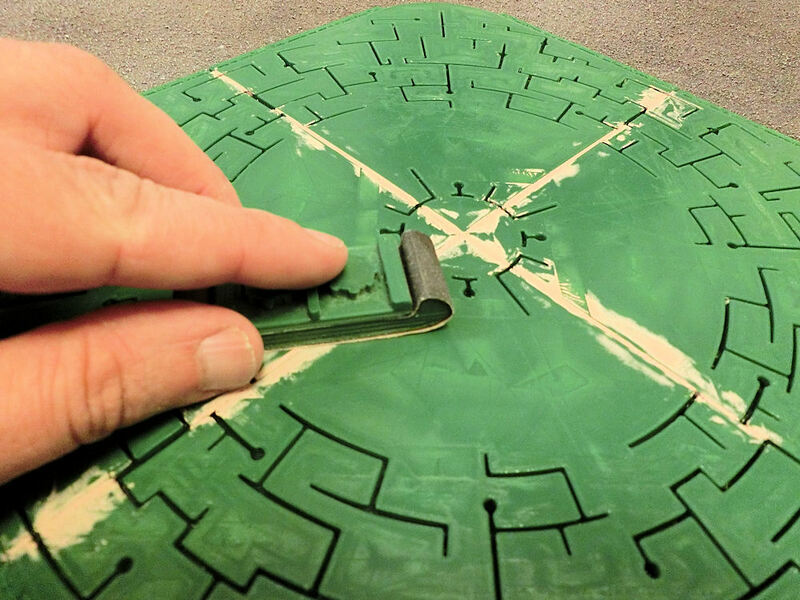 ▲ The picture above shows the top surface of our Necrontyr Landing Pad, which is printed in 4 parts and then glued together. We created a smooth surface by filling the gaps with wood filler. Pretty much any type of fine filler can be used with PLA models. ▲ After you've squeezed a little filler on to the plastic spreader, simply smooth it into the cracks between sections. ▲ Once the filler has dried, you can quickly remove any bumps using a small sanding block and some fine sandpaper. We used 400 grit paper for our landing pad. 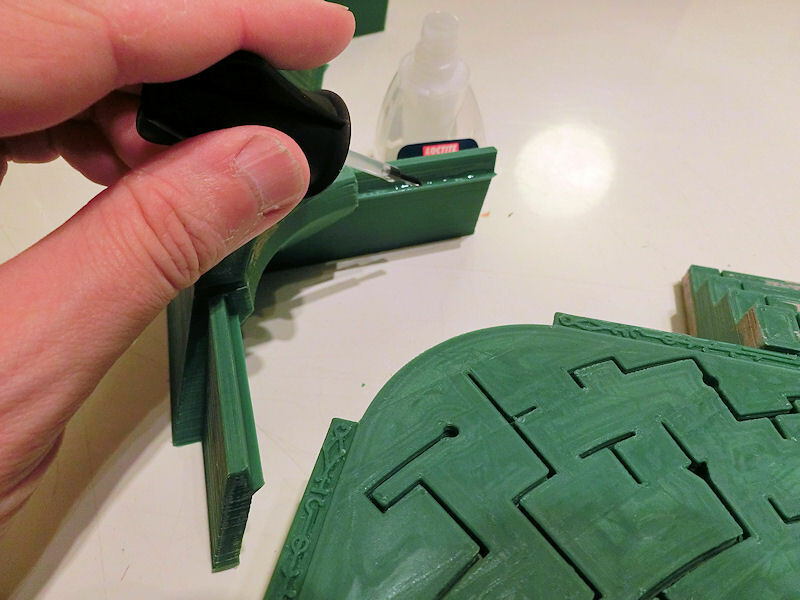 Terrain models printed with PLA filament can be assembled with superglue. We recommend a brush applicator with superglue, to minimise unwanted mess.